Two stewards of the Pakistan International Airlines (PIA) who were detained in the French capital last week in connection with their involvement in drug smuggling have been sentenced to two years in prison each by a French court, it emerged on Thursday. Flight Steward Tanveer Gulzar was arrested by French customs after four packets of drugs were recovered from hidden pockets of his coat during a body search at Paris’s Charles de Gaulle Airport. Steward Amir Moeen was detained after police interrogated Gulzar. Investigators had presented the two stewards before a court in France, which handed down a two-year prison sentence to each of them after finding them guilty of smuggling drugs on Islamabad-Paris flight PK-749, sources in the airlines told DawnNewsTV. 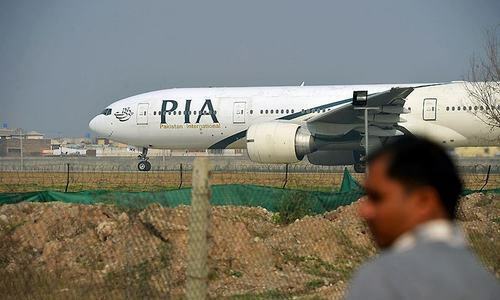 When contacted, PIA spokesman Mashood Tajwar told Dawn.com that airlines officials are aware of the reports of sentencing, but they are awaiting a copy of the court verdict. Once the judgment has been received, the stewards — who had been suspended — will be dismissed from service, Tajwar said. French authorities had arrested Moeen from his hotel on Gulzar’s tip. According to sources, he had allegedly facilitated Gulzar in smuggling the drugs. Sources told DawnNewsTV that the aviation secretary has written to PIA CEO Musharraf Rasool Cyan, asking him to submit a report after assigning responsibility on officials involved in the incident and those found to have shown negligence.